Snow-capped mountains, gorgeous blue lakes, amazing views of rolling hills, picturesque landscapes, lush meadows, beautiful villages and historic cities will leave you spell-bound on Best Single Travel's vacation to 4 amazing countries. Cruise the most castle-studded stretch of the Rhine River and visit the fairy tale castle that inspired Walt Disney. 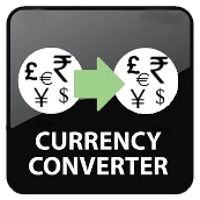 Arrive in Amsterdam (airport code AMS) and take your provided shuttle to the group's hotel. 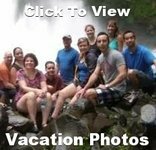 Meet all your new singles travel friends as we are greeted in the lobby by our tour host at 5:00pm. Then walk to a local restaurant for dinner (not included). Tonight we our guided tour takes us through the Red Light District. See for yourself the oldest profession of the world. Walk past monuments and through old streets, one of which is the well-known 'Zeedijk', once one of the most dangerous streets in Amsterdam - where Seamen could be found looking for local amusement. Nowadays it is a safe area, full of lively Dutch pubs and restaurants and the shady bars of yester-year are long gone. Today we enjoy a full day tour in and around Amsterdam. In the morning we drive to the fishing villages of Volendam and Marken, where we will visit a cheese farm and wooden clog maker. 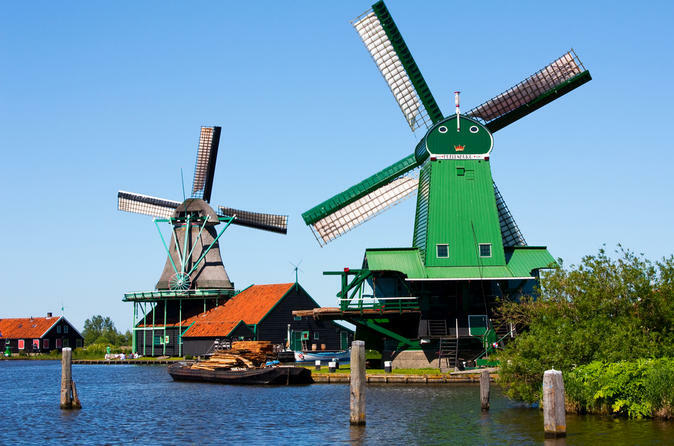 Later we will of course take a look at the world famous windmills and enter the Windmill De Kat, the only remaining working windmill in the world which makes paint. Our first day in Amsterdam, often called 'Venice of the north' would not be complete without a canal boat ride. Pass along some of the city’s most beautiful spots. View the magnificent houseboats and homes that dot the canal banks, along with the usual parade of bicyclists. While gliding through the old center of the city you see elegant merchant’s mansions, carillon-crowned churches and the warehouses with their rich history from Holland’s Golden Age. Tonight we dine together at our Welcome dinner in a local Restaurant. Relax on our morning bus ride as we depart Amsterdam for Germany. 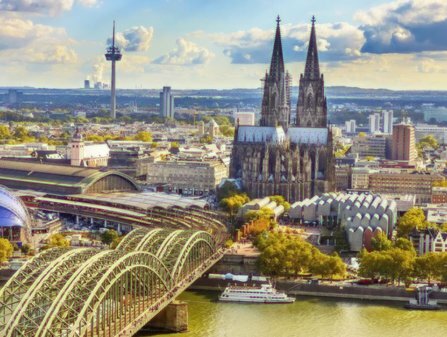 Our first stop will be Cologne, a 2,000-year-old city spanning the Rhine River in western Germany, for free time for lunch and shopping. View the the twin-spired Cologne Cathedral known for its gilded medieval reliquary and sweeping river views. A short drive takes us to Marksburg Castle, the only hilltop castle along the Rhine which has never been destroyed. This impressive castle, located above the town of Barucach, has buildings dating back to the 13th century,and wall rings containing a keep, residential buildings, baileys and bastions. Travel back into the Middle Ages on our guided tour, view the interior rooms such as a castle kitchen, great hall, bedchamber, chapel, armory, wine cellar and battlements allows us to travel back into the Middle Ages. We spend the night is in Koblenz, an ancient city in central Germany, and gateway to the terraced vineyards and ruined castles of the Rhine Gorge. In the center of town is a monumental statue of William the Great that marks the confluence of the Rhine and Moselle rivers. After breakfast we drive to Sankt Goarshausen to board our ship for an amazing day on the Rhine River exploring the Loreley Valley. The Rhine is 820 miles long, from Switzerland it flows through Germany, eventually emptying into the North Sea in the Netherlands. 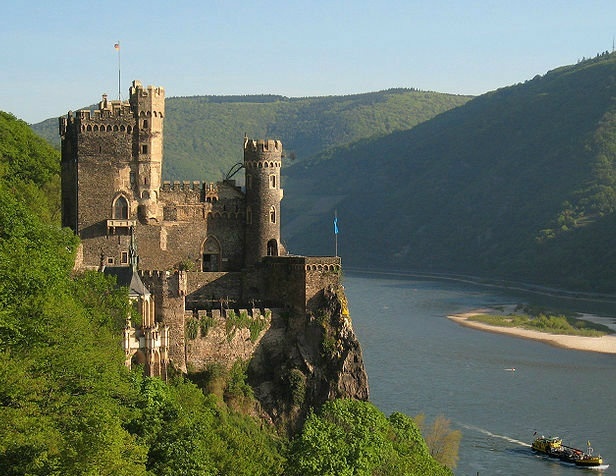 The most scenic section is the Middle Rhine, between Rüdesheim and Koblenz due to the number of historic castles, romantic towns and wine vineyards peaking over the mountain cliffs, which is why UNESCO declared it a World Heritage Site. Enjoy the scenery on our morning drive from Fussen to Rothenburg ob der Tauber, known for its well-preserved medieval old town and and part of the Romantic Road. 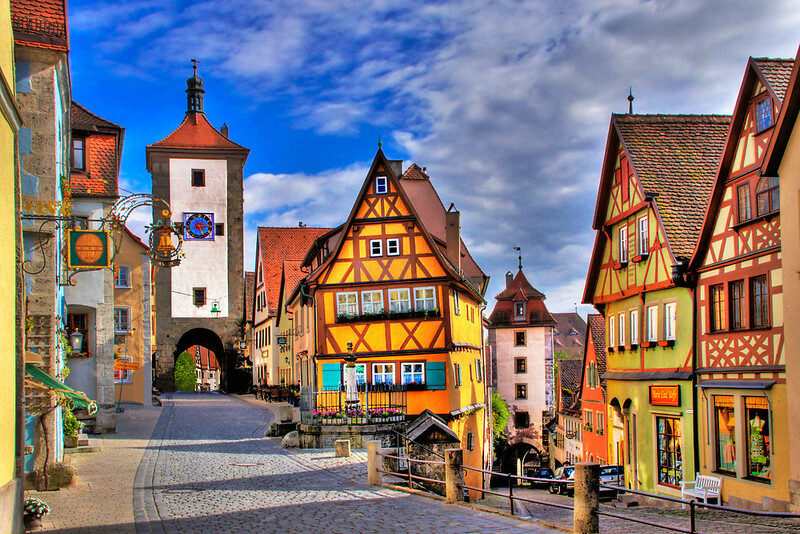 Nestled amidst beautiful, unspoiled countryside and still with a largely intact walkable town wall with medieval fortifications, Rothenburg with its winding alleyways and artistic treasures is the ideal place to relax after our guided tour. Stroll through the old town center of Rothenburg, with some of the loveliest historical sites in Bavaria. This medieval town has a skyline with 42 gates and towers and is quite unmistakable. This afternoon is free time to explore, visit a museum or hunt for that special souvenir. One of the town highlights is to step on years of history as you walk on top of 1.5 miles of towered walls. You can't help but ask yourself whether time has stood still, as you amble past the beautiful old houses, secluded squares and tucked-away corners of the old quarter, where towers, taverns and town gates has stood for centuries. 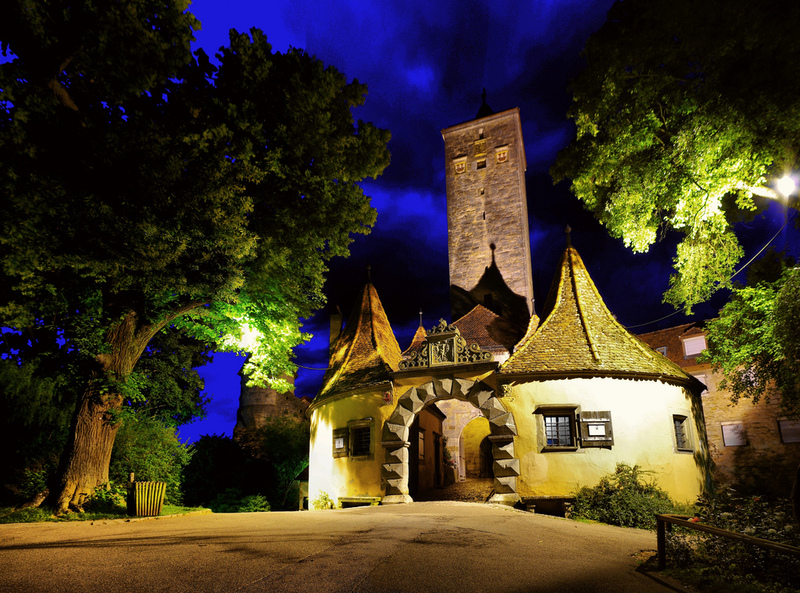 Tonight we accompany the Rothenburg Night Watchman on his entertaining and informative rounds through the darkness. Follow him through dark alleyways and across dimly lit squares and enjoy the special mood of the town at night. Listen to his stories and find out how the people lived in the Middle Ages. We have an all morning bus ride as we travel to the castles of Neuschwanstein and Hohenschwangau, built for 19th-century Bavarian kings. Both royal castles overlook the village of Hohenschwangau, Bavaria, known as “The High Country of the Swans”, a fairy-tale like village. 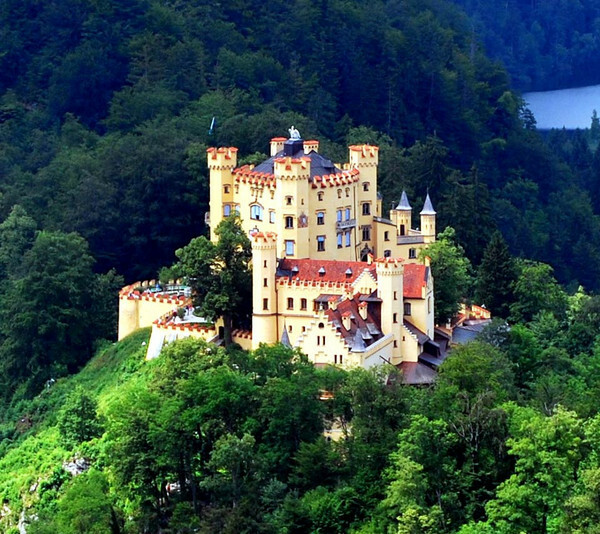 Hohenschwangau Castle is a short walk up from the village and the grounds outside Hohenschwangau Castle are full of interesting fountains, rose gardens, and fabulous views. Inside, we'll see where Crown Prince Maximilian lived and worked. Since the castle was used until quite recently, it includes lots of artifacts, artwork, and gifts, as well as a very interesting reading chair. There was once even an elevator added. Travel at a leisurely pace, by horse-drawn carriage as we ascend the steep hill to Neuschwanstein Castle, stopping just a short walk from the Castle that inspired Disney. Built by King Ludwig II of Bavaria, known as the “Fairy-tale King”, the castle has a beautiful inner garden surrounded by a walled courtyard. Though only 14 rooms were finished before Ludwig II’s sudden death in 1886, the double-story throne room reaches 49 feet in height and is encircled by galleries on both floors. Today we leave Germany behind as we drive to Innsburck, Austria, the capitol of the Alps. 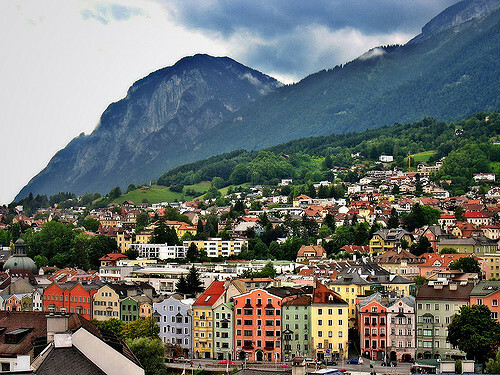 Experience Innsbruck’s old town on our guided walking tour and view over 800 years of the city’s colorful history: The Golden Roof, Emperor Maximilian I’s splendid alcove balcony, bore witness to jousting tournaments. Lavish celebrations were held at the Imperial Palace. 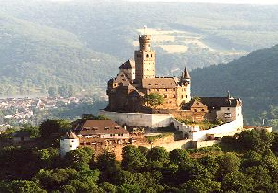 Ambras Castle became a magnificent feature above the city. And guards kept watch for fire, storms and enemies from the City Tower until the 20th century. the exciting Middle Ages today. The mountain at the heart of Innsbruck is the Nordkette, part of Austria’s largest nature park, the Karwendel Nature Park. The Nordkettenbahnen lifts will take us high up into the mountains from the city center. Our journey takes just 20 minutes from the lift station to our first stop, Seegrube at 1 and 1/4 miles up. From the Seegrube, another cable car continues 1000 feet higher to the Hafelekar. Once at the top, we can enjoy breathtaking panoramic views of the surrounding mountains. Tonight enjoy a stroll through the old town and check-out one of the many restaurants for dinner. Travel through the Arlberg Road Tunnel, at 6.6 miles it is Austria's longest road tunnel, on our way to Lucerne, a small city in Switzerland known for its preserved medieval architecture and snow-capped mountains surrounding Lake Lucerne. Stroll through the beautiful and historical old town, see the famous sights in the city, and discover more about Lucerne with our local guide. Walk through the “City of Lights”, cross the Chapel Bridge, a 14th-century wooden bridge spanning the Reuss River. This is the oldest covered wooden bridge in Europe and the oldest surviving truss bridge in the world. View the historical city walls together with the Spreuer Bridge and the Museggmauer with its 9 towers. Spend the morning in the Swiss Alps. 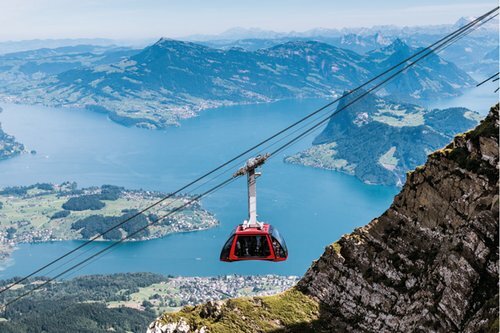 Our Golden round trip will takes us to the most spectacular spots on Mount Pilatus and to the summit by boat, cogwheel railway, aerial cableway and Panorama Gondolas. Enjoy a boat trip on Lake Lucerne and a view of the surrounding mountains. Then in Alpnachstad we board the steepest cogwheel railway in the world to reach the summit at 6994 feet above sea level. Ride past sheer rock faces and pretty mountain streams toward the green meadows below. 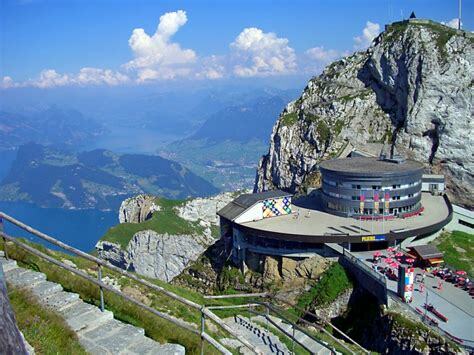 During your free time atop Mt Pilatus, venture on a high-altitude stroll, grab lunch or enjoy the vista from the terrace. 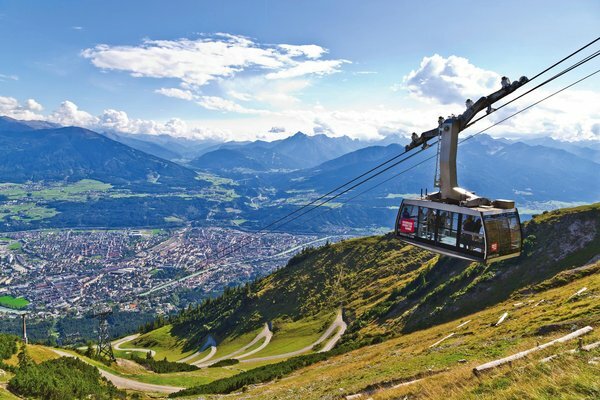 Then we will meetup for the descent on the aerial cableway, known as the Dragon Ride' .The cabin’s spacious design affords us more magnificent views over the Alpine lakes and rugged peaks. We end our trip with a panoramic gondola ride. There will be free time this afternoon for shopping and exploring Lucerne on your own. On our way to Zurich we stop at Rhine Falls, the largest waterfalls in Switzerland. Over a width of 492 feet and a height of 75 feet, an average of 700,000 litres of water cascade over the rocks every second. We'll get to see the Rhine Falls up close on our boat ride to the rocks in the middle of the falls. Take this opportunity to climb to the top of the rock and enjoy the magnificent spectacle from the viewing platforms. Drive around Zurich, a global center for banking and finance that lies at the north end of Lake Zurich in northern Switzerland. 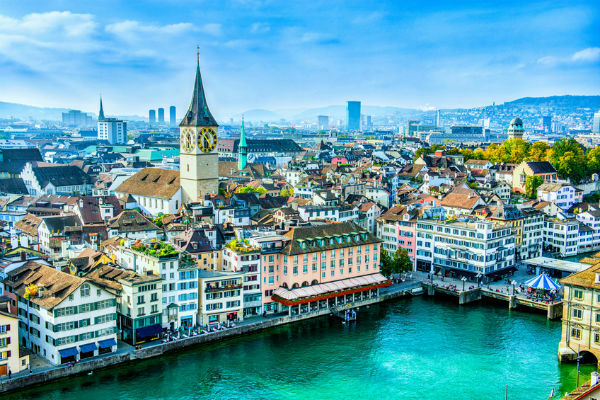 Our tour passes by the most important landmarks in the city of Zurich, such as the castle-like National Museum, the world-famous Bahnhofstrasse, historic Limmatquai, Zurich’s Opera House, St. Peter’s Church with Europe’s largest clock face and Lake Zurich. Once we arrive at our hotel located near the Zurich airport. Check-in and relax before our Farewell Dinner tonight. Time to say "Tschuss" to Switzerland and another singles vacation. 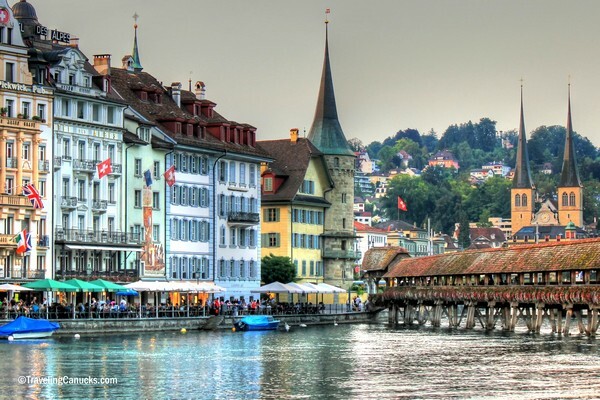 Depart anytime today, as we take the hotel shuttle to the Zurich airport and our flights home.